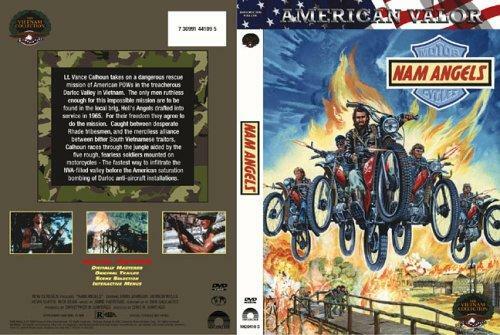 Lt. Vance Calhoun takes on a dangerous rescue mission of American P.O.W.s in the treacherous Darloc Valley in Vietnam. His only chance to escape is with the help of five young, fearless soldiers on motorcycles. There are bad films I hate, and there are bad films to be savored. Nam Angels would fit the latter type. This is a cheap, preposterous, and insulting to the intelligence "Vietnam" film made in the Phillipines. Despite its faults, there is enough action and energy packed into its 91 minutes that it will most certainly liven the mood in any room. Get a load of this plot: An army Lieutenant (Brad Johnson) and his small recon unit are ambushed during the Vietnam war. He escapes, but two of his men are taken prisoner. Not by the NVA, but by a tribal army led by a mysterious white mercenary who is seen as a deity by them. Hello, Apocalypse Now! The area where the men are being kept prisoner is about to be "bombed into no-man's land". The men are considered expendable. Lieutenant Calhoun, desperate to get his men out, decides to recruit four California Hell's Angels to ride into the area with him on motorcycles and take down the tribal army and their leader!!! Yes, but it gets better! See, there's also a hidden cache of gold dust within the enemy fort. $10 million worth, one soldier calculates after merely picking up one vile of the stuff and dumping a little out. The Hell's Angels will get the gold, and Calhoun will get his men if all goes according to plan. How could a plan like that go wrong? The guys have even thought to have a supply of fuel waiting for them at the midway point of the trip so they can make it back. Now how many low-budget films would have considered that detail, huh? Well, as soon as the Angels find out the whole thing is really a rescue mission, they do what you'd expect. They turn on Calhoun. It's up to him to pull the group together, defeat the tribal army, and get his men out. Wow! This film is extremely violent. That's a good thing, since whenever anyone is just standing around talking, you get treated to poor dialog and acting by all. I'd estimate this film has a higher on-screen body count than even Commando. Speaking of that film, the number one baddie from it (Vernon Wells) is the bad guy in this one, too. Gone is his Freddie Mercury mustache, and now he has a bleached blonde mullet tied behind his head in a pony tail. He gives by far the most lively and nuanced performance, but he is by all means a destitute-man's Marlon Brando. I wouldn't dream of revealing who all lives or dies, but in the final scene, a quote from Milton about heaven or hell flashes on the screen. It appears to have no logical connection at all to the story. Brad Johnson is not bad as Calhoun. His character is supposedly from West Texas, and he fights mostly with a lasso and a sawed-off shotgun. Johnson actually went on from this film and had somewhat of a decent career. The rest of the cast is pretty awful. By the way, what were California Hell's Angels doing in Vietnam?? Were they laying low after all the chaos they caused during the Rolling Stones' set at Altamont??? 5 of 10 stars from the Hound. During the Vietnam war, Lt. Calhoun's (Johnson) men are taken prisoner by a tribal group run by "A mysterious white man" who is also a "round-eye", named, oddly, Chard (Wells). The top brass considers the trapped men "expendable" but Johnson does the only logical thing: he recruits four Hell's Angels for a five-day mission and bribes them with millions of dollars of gold dust hidden in the hills of 'Nam. All they have to do is help Calhoun rescue his men. The 'Angels reluctantly agree, and there is some trouble and strife along the way, but a badass from West Texas who fights with a lasso and sawed-off shotgun (that would be Calhoun), teaming up with some tough biker dudes is going to be a double-team that will prove tough to beat. Will Calhoun's gamble work? At first, this Cirio movie seems to be yet another Vietnam/jungle slog that seems very familiar. But once the bikers come into the equation, things change for the better and you realize that you should be giving the filmmakers points for originality. It was only natural: take two exploitation genres - the (Vietnam) War movie and the Biker movie, and simply find a way to mash them together and make it work. Thankfully, it does, and Roger Corman can put this one in his win column. Brad Johnson looks like a young Tom Berenger, but this isn't exactly Platoon (1986). Vernon G. Wells is properly evil, especially with his ponytail. Amidst the classic barfights and "pew-pew!" shooting scenes, at least on the Corman-released DVD we saw, we noticed some odd editing. It looked like the opening credits and perhaps some other scenes were re-edited for this DVD release. We can't confirm this, and it's doubtful they cut out anything good, but it would be interesting to see a different print. If you read our Operation Warzone (1988) review, you'll remember how we discussed that movie's highly inappropriate soundtrack, with 80's synthesizers blaring in 'Nam. Well, Nam Angels falls into that same trap. But if you're looking for logic, why are you watching this movie in the first place? There are a lot of nonsensical things going on here, from the plot itself to the John Milton quote at the end. But bikers popping' wheelies in the jungles of 'Nam is cool enough to make up for it. 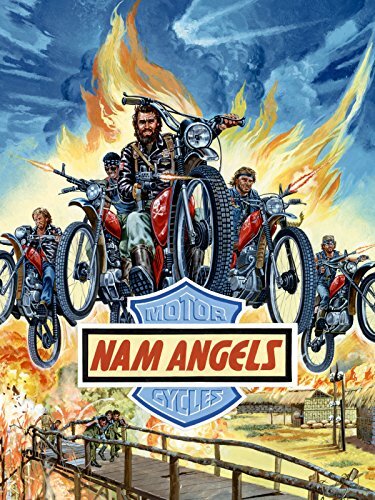 Nam Angels is worth checking out.